Mt. 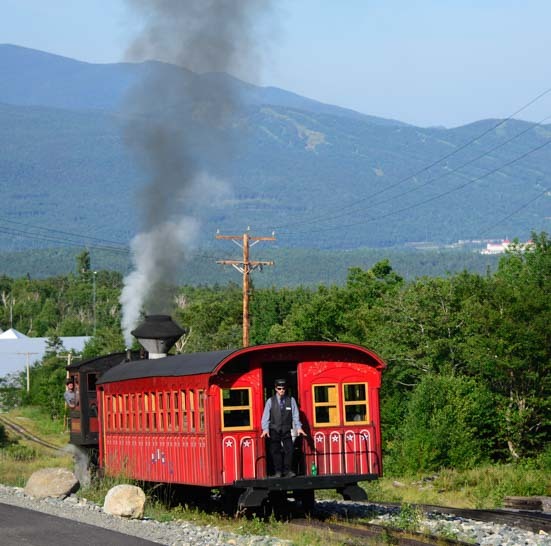 Washington Cog Railway - The Little Engine That Could! Mt. 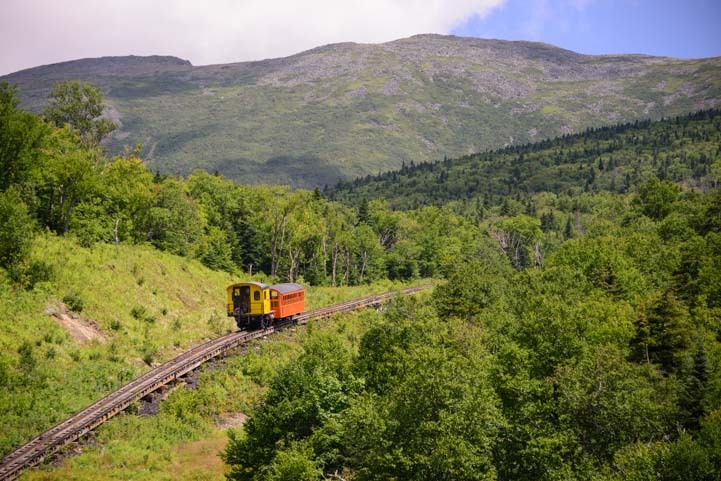 Washington Cog Railway – The Little Engine That Could! 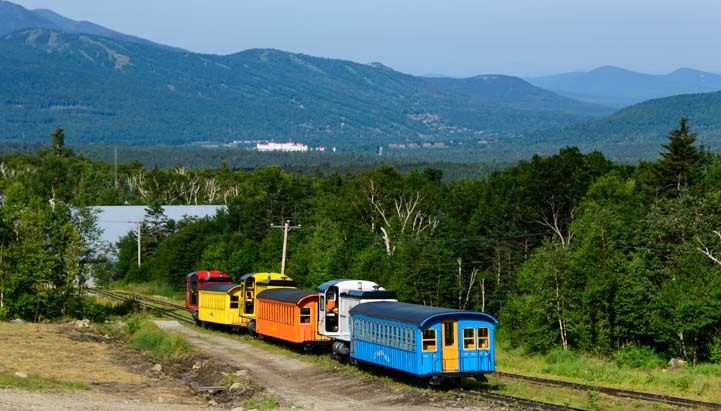 July 2015 – One of the most well known landmarks in New Hampshire is Mt. Washington, the tallest mountain in the northeast. And on this mountain rides one of the best excursions you can find anywhere: The Mt. 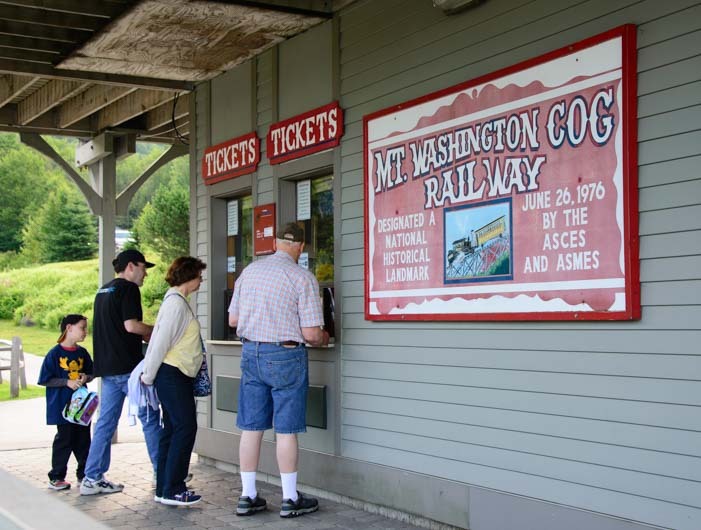 Washington Cog Railway. The Mt. 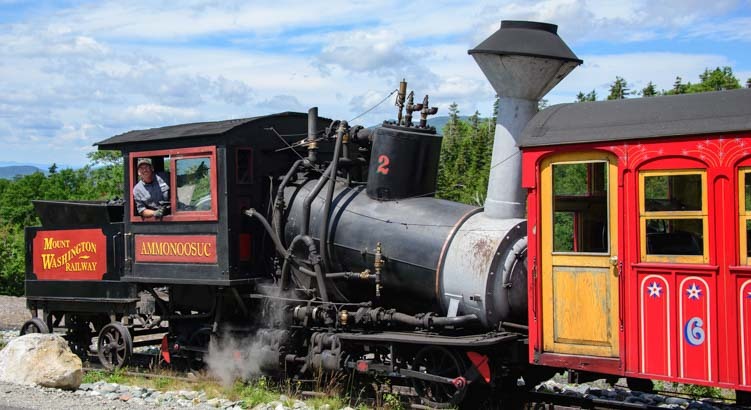 Washington Cog Railway — what fun! 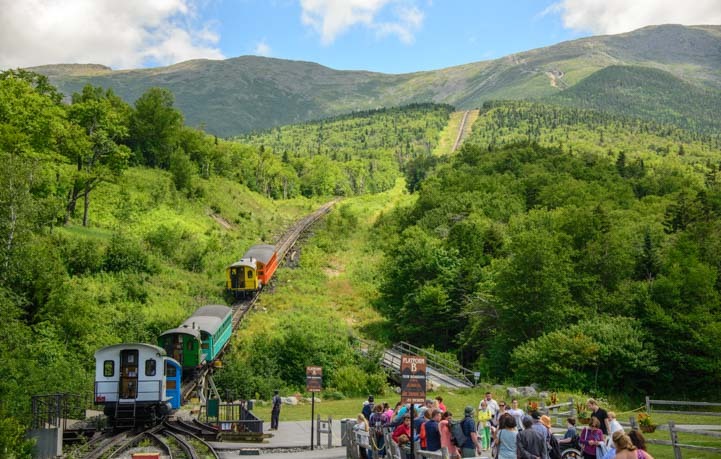 The brainchild of Sylvester Marsh, an inventor and grain merchant who made a fortune designing machinery for the grain industry in the mid 1800’s, the Cog Railway is a fantastic train ride that crawls straight up the side of the mountain. No switchbacks needed! 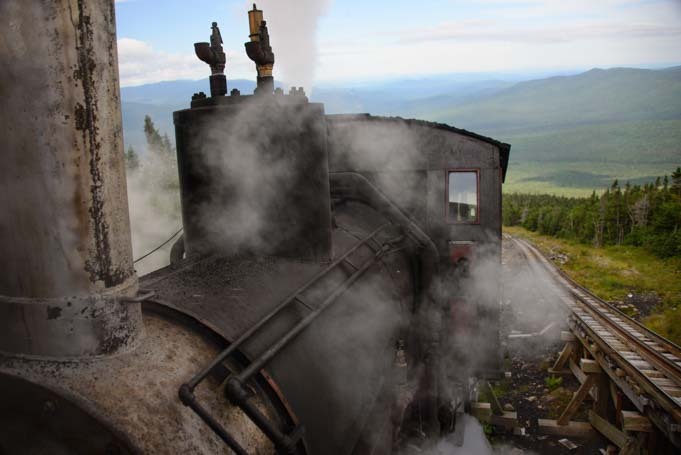 The coal fired steam engine burns a lot of coal and blows off a lot of steam on the way up the mountain! Back in the 1860’s, after retiring from the grain industry, Sylvester hiked up Mt. Washington with a friend. On the way, he encountered the typically brutal weather that this particular mountain likes to dish out. Other hikers had died on the mountain just prior to his hike, and he and his friend were grateful to make it to the Tip Top House, a hiker’s hut at the top. Folks come early to get tickets or confirm reservations. He was astonished the next morning when the storm subsided and the views unfolded all around him. Most folks of that time never got to see much beyond their farm fields, and he wanted to share this incredible beauty with everyone living at sea level yet make it easier and safer for them to get to the top. He set about designing a train that would use not just normal railroad tracks but a third rail in the middle that was made of chain links like a bicycle chain. A cog on the bottom of the train would turn and claw its way up the mountain using this third rail to inch along. 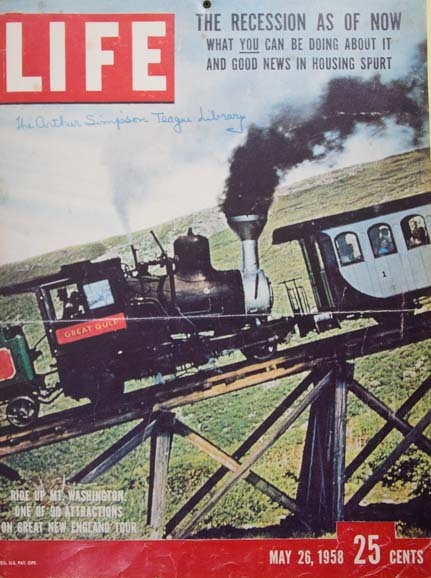 The Cog Railway has graced a lot of magazine covers. This Life cover is from 1958, 89 years after the railway opened! It was a clever idea, but the big railroad barons of the day openly laughed at him. He was a grain guy, after all. What could he possibly know about trains? Well, he was a man with a vision, and he opened the railway to the public on July 19, 1869. 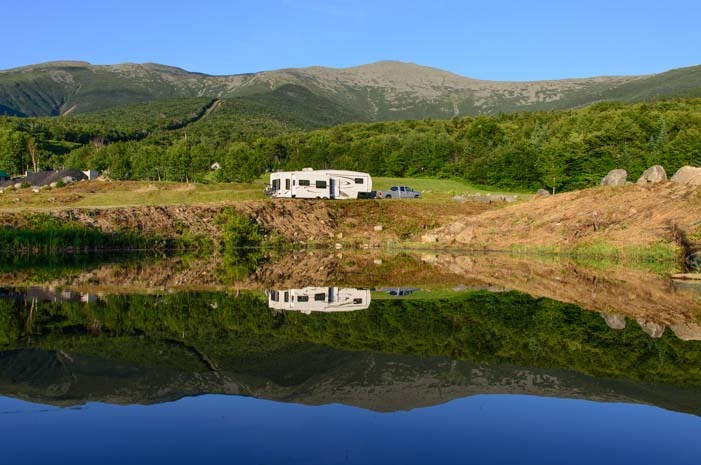 It has been a huge hit with visitors to New Hampshire’s White Mountains ever since. The construction wasn’t easy, and everyday the construction crew rode a cog train up to the end of the line, wherever the previous day’s construction had left off. At the end of the day, they each rode cog sleds down the mountain. These sleds had brakes, but still, what a wild ride that must have been! 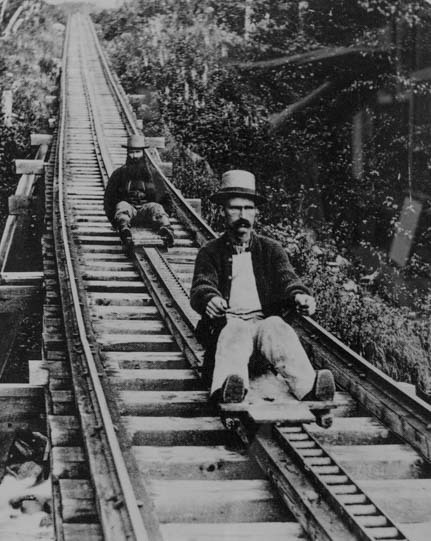 When the tracks were being built, the construction workers would slide down the mountain on sleds at the end of the work day! We got caught up in watching the outsanding PBS documentary video about the history of the Cog Railway in the museum before our ride. We gawked at the magazine covers and old photos and mock-ups of the train that were on display. Suddenly, a train whistle pierced the air, and we ran outside to see the bright red train chugging up the hill from its overnight storage spot in a cloud of steam and smoke. What a thrill! Our train, Engine #2, comes up the hill to pick us all up. 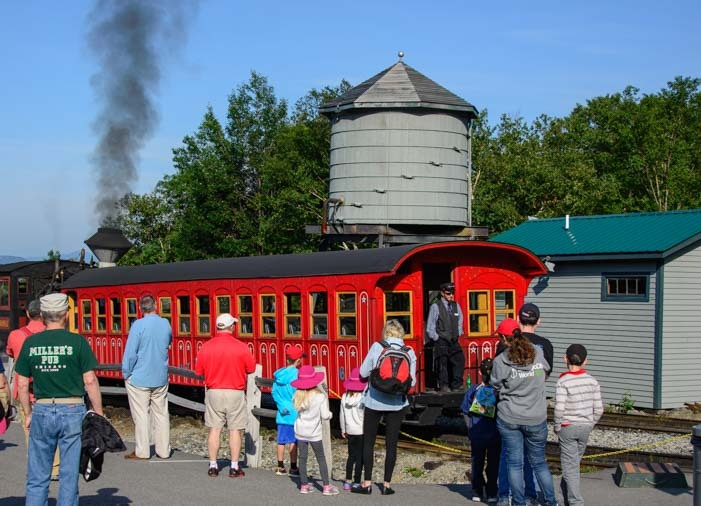 The coal fired steam engine runs just once each day, at 9:15 in the morning. And it is the real deal — authentic 1875 technology at work! 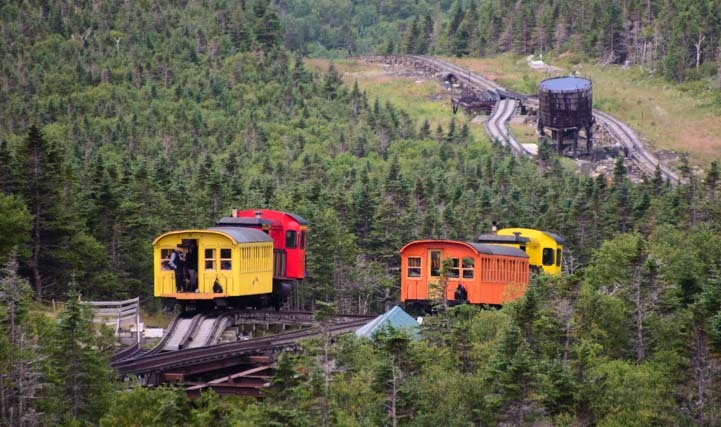 The Cog Railway actually has five other trains and coaches that run up and down the mountain all day long. They operate on biodiesel and make the journey a bit more quickly. Biodiesel trains make the trek up the mountain after the steam engine’s early morning run. The 3 mile ride is a one hour trip on the steam train, but it’s about 20 minutes less on its biodiesel sisters. This is a ride that’s fun for all ages. Before we hopped aboard, our Engineer, Eggy, showed us the enormous pile of coal that would be shoveled into the fire by the Fireman, Ray, to keep the water boiling. Shoveling the coal is serious work, and Ray would be shoveling as fast as he could go during the steepest part of the climb, a 37.4% grade! Everyone aboard the train was grinning as Eggy blew the whistle. With a lurch, the train started the climb, pushing our coach car ahead of it. The engine car is built on an angle so it sits fairly level as it climbs up the mountain. The coach car isn’t, however, and we were pitched back in our seats and aiming for the sky! A gorgeous view of the vast green valleys and mountains grew quickly behind us. In front of us, the cog rail was clearly visible in the middle of the train track as it snaked its way up the mountain. We crept up the mountain at the pace of a leisurely stroll, and noticed that each railroad tie was numbered. 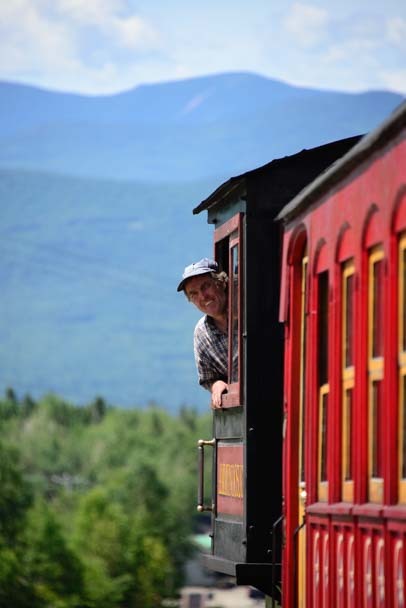 Our Brakeman, Kelly, told us that four people spend all day every day maintaining the tracks! About halfway up we came to the Halfway House, a building that seems to sit at an impossible angle on the edge of the mountain. Situated at 4500′ elevation, the floor is actually quite level, it’s just that the pitch of the mountain is so steep it looks like the house itself is tilting! Not long afterwards we stopped for few minutes to get more water for the boiler. The water source at this important spot on the mountain is spring fed, and 300 gallons of water were poured into the tank with a gravity feed. Then we reached the steepest part of the ride at a trestle called Jacob’s ladder that stands 25′ above a ravine. What does a 37.4% grade feel like in a train? Well, the seats in the front of the coach were 14 feet above the seats in the back of the coach — and the kids just loved struggling up and down the aisle between the seats!! As we climbed higher and higher, the views behind us became ever more expansive. Suddenly, we noticed people walking up a trail towards the train, and we realized that these folks had all hiked up from the bottom! 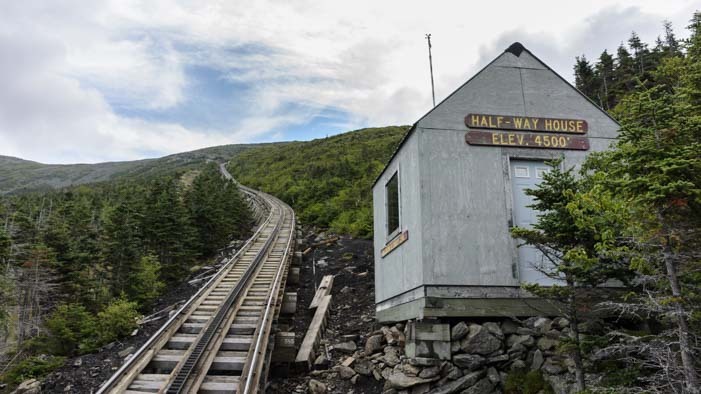 The Cog Railway sells one-way tickets too, so undoubtedly some of these hikers would hitch a ride down after getting triumphant pics of themselves at the top. 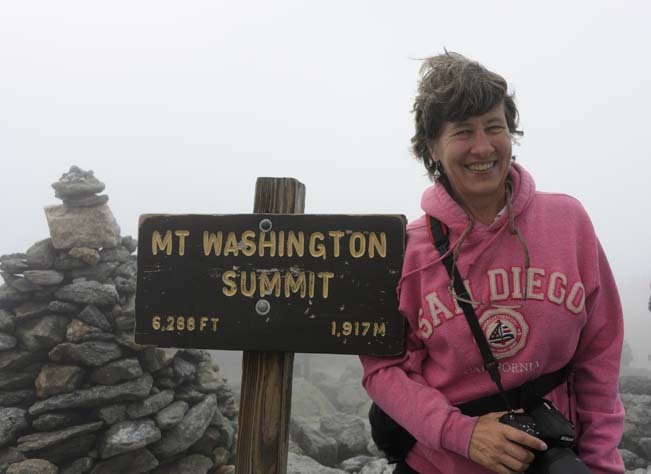 There was quite a line of hikers waiting to take selfies with the Mt Washington Summit sign at the top, and who can blame them. It’s quite an accomplishment to hike up. We felt a little soft for having ridden the train, but we had no shame, and we got in line and took pics with the summit sign too! Hey, even if I didn’t hike I can still get a pic at the top, can’t I ? We had about an hour at the summit before our train would start the journey back down the mountain, and we made a bee-line for the Mt. Washington Observatory where we took a tour of the weather station. Our guide, Kaitlyn, showed us the instruments that track the wind speeds and monitor the weather, and we were floored to learn that scientists actually live and work on the top of Mt. Washington year round, manning this station 24/7 in twelve hour shifts. Mt. 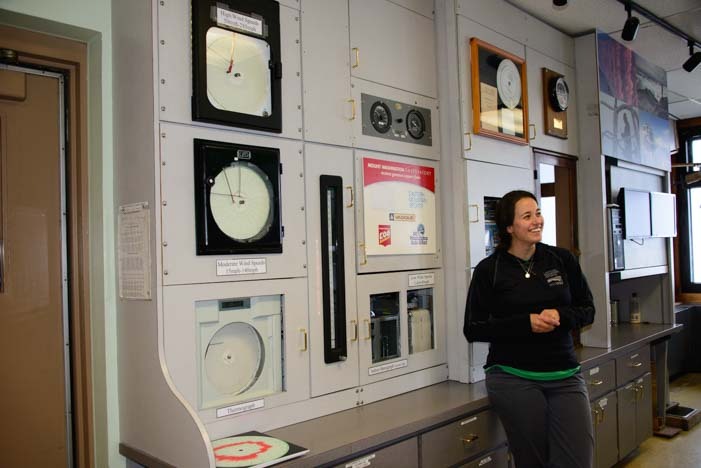 Washington has the most fearsome weather in the world, and our guide, Kaitlyn, explains how scientists live and work there, monitoring the instruments 24/7 ! They work for 8 straight days on the mountaintop and then have 6 days off, and they live all together, dormitory style, with a comfy common room, kitchen and bedrooms that reminded me of my college days. Volunteers can participate too, and we got a kick out of seeing two grey haired volunteers coming into the dorm after their shifts. 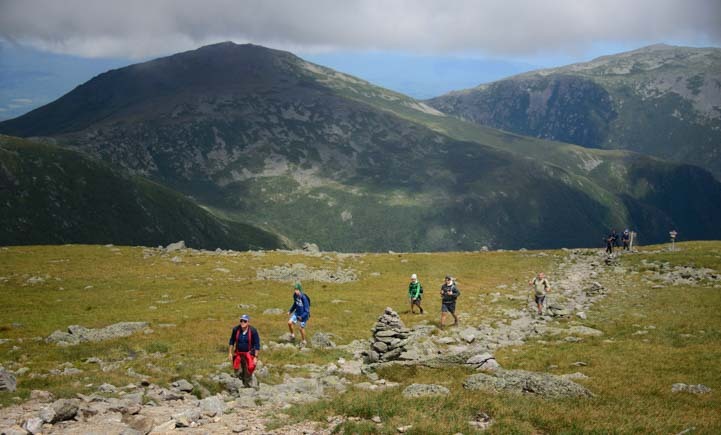 The fun for them, they said, besides the working at the weather station itself, was that they could enjoy the hiking and outdoor activities of the White Mountains all summer long. 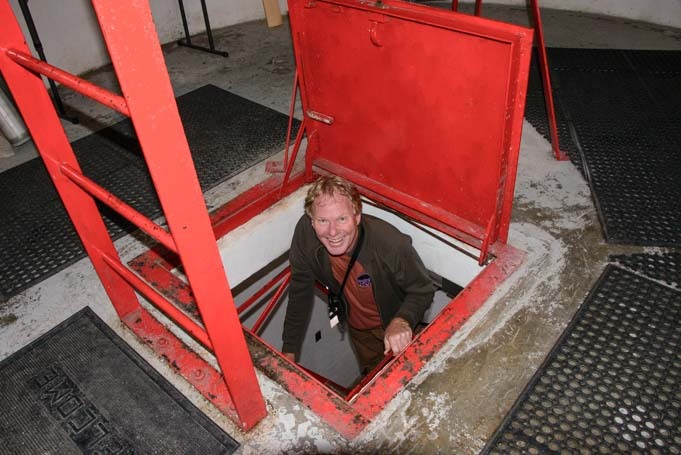 Kaitlyn then took us up through a hatch and out onto the roof of the observatory where we saw the wind vanes in action. Mark climbs up towards the roof deck where the wind vanes are mounted. The highest wind speed ever recorded at a manned weather station occurred right here back on April 12, 1934, when a wind gust hit 231 mph. I had heard a story long ago that the wind vane was blown right off the mountain when that wind gust hit, but we discovered that’s an urban legend. Four volunteers — the founders of the observatory — were manning the station that day, and they actually retrieved the wind vane from its spot on the roof and verified that it was functioning correctly and that its readings were accurate. Having the instrument blow right off the mountain makes a much better story, though! Since that time, a bigger wind gust was recorded in Australia during Cyclone Olivia in 1996. 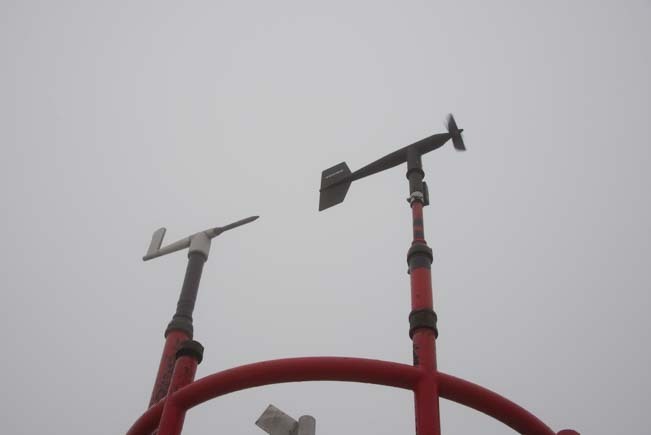 However, that happened on an unmanned weather station, so, awesome as it was, it doesn’t have quite the same mystique! Before long, we heard our train whistle blowing again, and it was time to go back down the mountain. Still flushed with excitement from seeing the inner workings of the Mt. 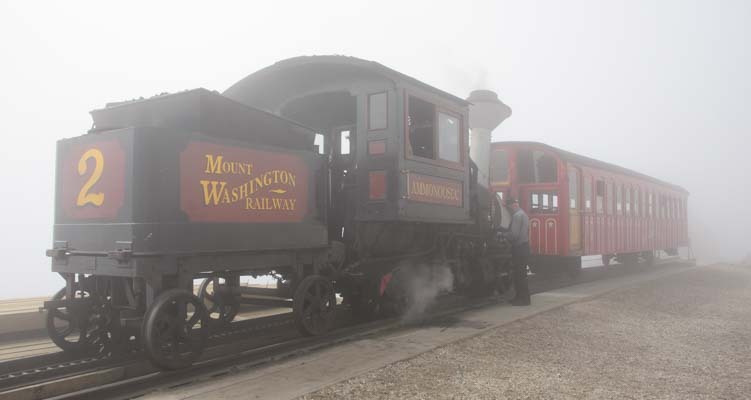 Washington Observatory, we quickly got swept up in the incredible marvel of coasting a big train engine and coach full of passengers straight down a mountain without losing control. We had fog at the top, but that didn’t dampen our spirits one bit! The train and coach are always oriented in the same direction with the train engine located below the coach. On the way up the mountain, the train engine pushes the coach. On the way down, the Engineer in the train engine uses compression brakes to slow the train and the Brakeman in the coach uses disc brakes to keep the coach from bumping into and pushing the train down the hill. It kinda reminded me of the brake action on our truck and trailer going down a mountain! 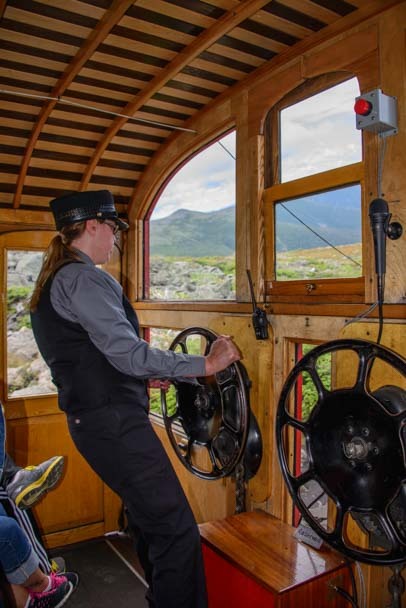 Our Brakeman, Kelly, worked constantly the entire way down the mountain feathering the brakes. She had two big wheels in front of her, one to make big adjustments and one for fine tuning. We were at such a steep pitch that it looked like she was leaning way back even though she was standing straight! Heading back down, our Brakeman, Kelly, feathered the brakes with two huge wheels. She isn’t leaning back, by the way. It’s the coach that’s on an angle! The noise of the brakes and the shaking in the coach were quite dramatic, and we watched in amazement as Kelly worked at the wheels. The jobs on this train follow the old tradition: first you become a Brakeman, controling the brakes in the coach, then a Fireman, shoveling coal into the hopper to keep the fire blazing to boil the water, and then you can be an Engineer, driving the whole thing. Up ahead of us we noticed that two of the biodiesel trains were at the junction area in the middle of the mountain. They were passing each other as one was coming up the mountain and the other was going down. We found out later that the dance of the six Cog Rail trains is a carefully choreographed ballet that is overseen by the director of operations who runs the whole show by radio. Each train leaves its station, going either up or down, at a very precise moment so pairs of trains can meet in the middle where a switching station allows two trains to be side by side and pass each other on parallel tracks. A train climbing up the mountain passes us as we coast down. Soon we were passing a train that was headed up the mountain. 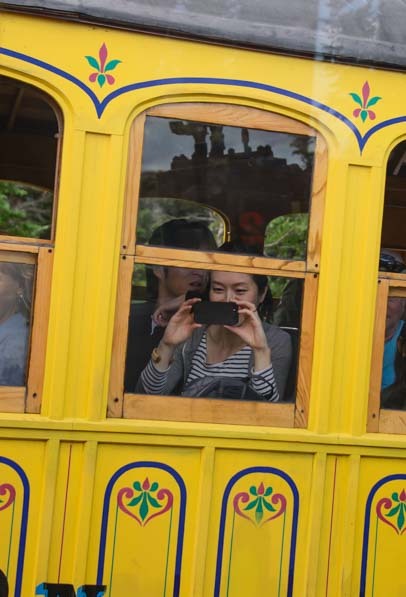 We took pics of them as they passed, and they took pics of us!! We all got photos of each other! When we finally reached the bottom and got out, we hung around for a while to admire our little train. It huffed and puffed and made all kinds of noises as the steam spewed out around it. We noticed there was a lot less coal in the hopper than there had been on the way up, and Ray’s and Eggy’s faces and hands were dusted with soot. But their beaming smiles gave away what fun they have with their jobs. The train crew and the team of mechanics tune up the engine every afternoon. It turns out that their day starts well before the 9:15 ride, because it takes them over an hour to warm up the engine and get the water in the boiler up to temp. 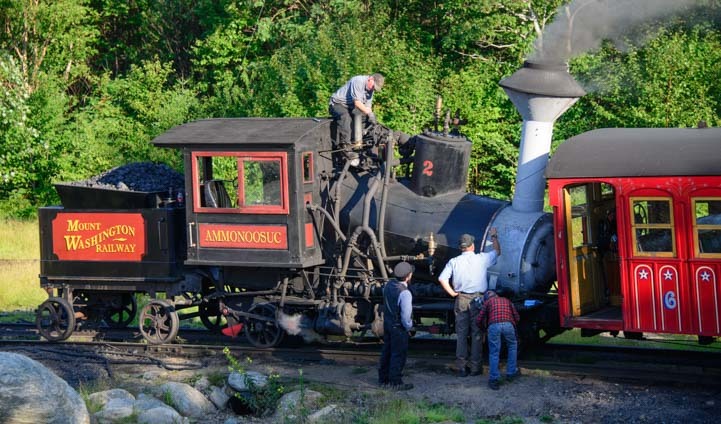 After the ride is over, they spend hours going over every part of the train engine, lubing the moving parts and tightening anything that has rattled loose. Meanwhile, the biodiesel trains were waiting their turns to go up the mountain. The biodiesel engine trains are much simpler, of course. The engines themselves are 600 horsepower John Deere engines, and the ride is smoother, quicker and a lot less noisy. But there is a romance to the old steam train that enchanted us completely. What an absolute blast this ride was! 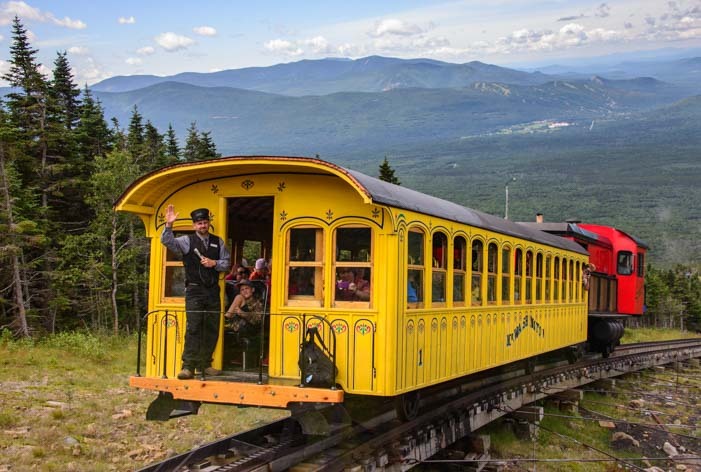 If you find yourself in the White Mountains of New Hampshire, a ride on the Cog Railway is an absolute must. 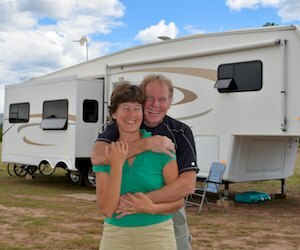 This fun little excursion is sure to put a smile on your face! 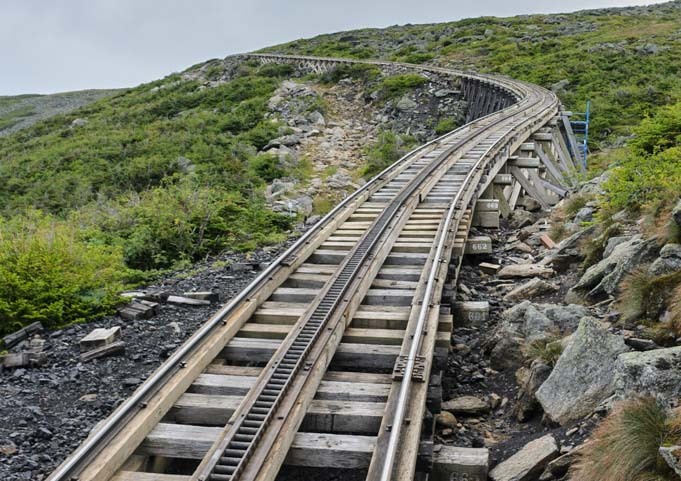 and the Cog Railway was a huge highlight during our stay there. 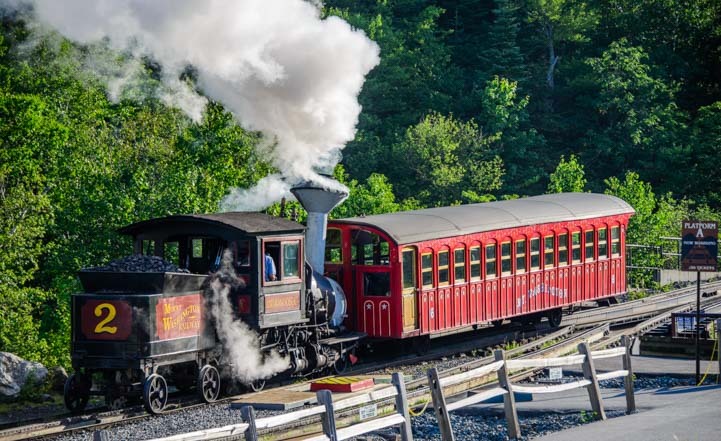 The trains run from late April through November and you can reserve tickets in advance. The Highest Wind Gust Observed by Man – What really happened that day! This entry was posted in New Hampshire and tagged Fun Rides, New, New Hampshire, Travel, USA, WP Travel by Roads Less Traveled. Bookmark the permalink.